British army chief of staff hails cooperation with IDF, meets IDF Chief of Staff Aviv, visits Yad Vashem. 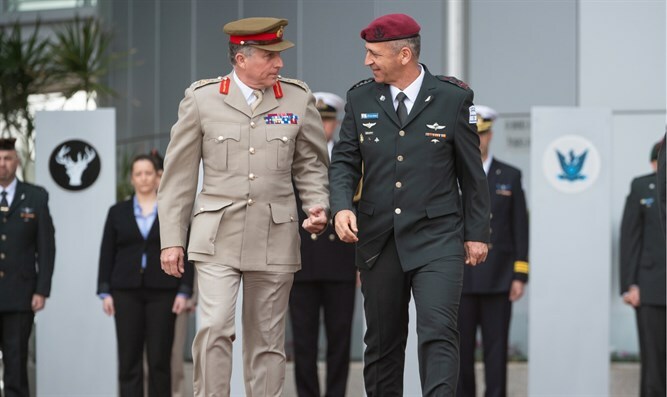 British Armed Force's Chief of the Defense Staff General Sir Nick Carter KCB CBE DSO ADC Gen on Sunday morning arrived in Israel and was received by an honorary guard headed by IDF Chief of the General Staff Lt. Gen. Aviv Kochavi, at Camp Rabin in Tel Aviv. Following the reception, General Carter held several meetings and toured Israel’s Northern border with 91st Division Commander Brig. Gen. Raffi Milo. In addition, General Carter took part in the initiation ceremony of the cornerstone of the "Arrow of Generations" at the Ramat David AFB, a project designed to illustrate the close partnership between the IDF and militaries around the world by founding landmarks throughout IDF bases. The ceremony that took place symbolizes the cooperation with the British military. Jewish parachutists from Mandatory Palestine trained at Ramat David during the Second World War. The "Arrow of Generations" is an initiative by the IDF's International Cooperation Unit. Its purpose is to investigate and mark the legacy of cooperation and joint activities that occurred throughout the country. As part of the project, 25 stones will be placed at landmarks throughout the country to mark the many historical events of partnerships with numerous partners from around the world. On Monday, General Carter will meet with the Head of the Military Intelligence Directorate, Maj. Gen. Tamir Hayman, and will lay a wreath in a ceremony at the "Yad Vashem" Holocaust Museum as part of his tour in Jerusalem. "His visit emphasizes the developing qualitative engagement between the IDF and the British military," an IDF statement said.